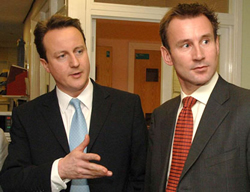 Shadow culture secretary Jeremy Hunt has performed a u-turn on lobbying, bringing the Conservative Party in line with the Labour and the Liberal Democrats. Shadow culture secretary Jeremy Hunt has performed a u-turn on lobbying transparency, bringing the Conservative Party in line with the Labour and Liberal Democrat plans to impose a statutory register of lobbying interest – less than a week after the Conservative manifesto said the industry could self-regulate. The manifesto, unveiled last Tuesday, pledges to “clean up politics: the expenses, the lobbying and problems with party funding”, saying “too much unacceptable behaviour has gone unchecked for too long, from excessive expenses to sleazy lobbying practices”. They will start by “curbing the way in which former Ministers have secured lobbying jobs by exploiting their contacts” and will ensure former ministers “are banned from lobbying government for two years after leaving office”. A policy described by lobbying transparency campaigners as “woefully inadequate”. Hunt was speaking at a 38 Degrees/Guardian debate on people power, in which voters chose questions for the three main parties’ manifesto writers. Responding to a question from a 38 Degrees member Hunt said the Conservatives now favour a statutory register of lobbying interests. When asked to clarify by 38 Degrees campaign director Hannah Lownsbrough, Hunt confirmed Tory policy is now for a “statutory register”. A statutory register is something 38 Degrees and the Alliance for Lobbying transparency have been campaigning for since July 2009. 38 Degrees will be updating our blog throughout the day with more information here. If it is not in the manifesto will it be binding?